cool down the warm filling. Every 30 seconds someone buys a Coco Puff. Dissect the numbers from Liliha Bakery and that's what you get. On an average day, every day except Monday when the bakery's closed, Liliha sells 250 to 300 dozen of its signature puffs. That's 3,000 to 3,600 little chocolate-stuffed pastries at 85 cents apiece. To put this in industry perspective, Napolean's Bakery sells about the same number of its most popular item, the Napple, daily. But Napolean's has 22 stores. Liliha has just one. base of the machine and insert a preset amount of filling. William Takakuwa, company president, says Liliha's niche is in the variety of its baked products. "If you walk in the front door and just stand there, you'll say, 'Whoa, that's a whole lot of stuff.' "
But the Coco Puff outsells everything. It's not even close. On busy days, the coco count goes as high as 500 dozen, or 6,000 puffs. 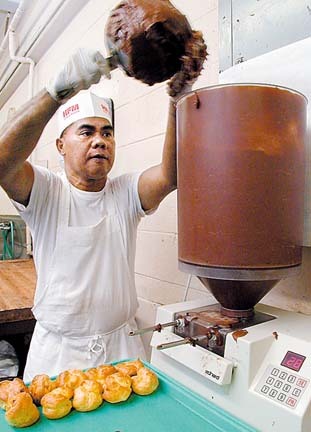 Liliha Bakery celebrates its 50th anniversary this month. It was in a tiny retail outlet at 1703 Liliha St. that Takakuwa's parents, Roy and Koo, first offered their baked goods for sale. His father had been working for a wholesaler making loaves of bread, but wanted more out of his baking career. In 1961 the Takakuwa's moved the business to Kuakini Street, but kept the Liliha name. It has been here ever since, growing and changing, but still a family concern. Roy Takakuwa ran the company until his death in 1985; Koo Takakuwa handled the company finances until retiring in the early '90s. She turned 84 yesterday. Chantilly frosting is piped onto each one. The bakery now has about 70 employees and gross earnings of more than $4 million per year. Liliha's first claim to fame was not the Coco Puff but the Chantilly Cake, which dates back to the '50s and remains the bakery's second most popular item, Takakuwa says. The chocolate cake has a distinctive, rich, buttercream frosting that is a local favorite. Takakuwa doesn't give out any recipes, so don't even ask. But he allows that the chantilly topping is basically a German chocolate cake frosting, without the nuts and coconut, and with a whole lot of butter added. As much as it may seem that the Coco Puff is part of our cultural history, it's really only been around about a decade. 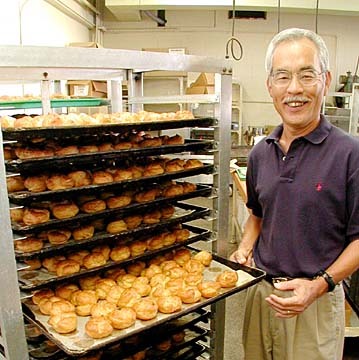 Takakuwa says a little chocolate cream puff did debut at Liliha about 30 years ago, the idea of the chief baker at the time. "He made it, sold it, and it was a fantastic flop. Nobody would buy it." shelves for 15 to 20 minutes, then frozen until needed. Around 1990, though, a new chief baker, Kame Ikemura, now retired, dug out the recipe, reformulated it, put a dab of chantilly frosting on top -- and the little treat took off. The filling is basically chocolate pudding -- evaporated milk added to cocoa powder. "We add a secret ingredient that has a lot of butter and makes it taste real good," Takakuwa says. "The thing that makes it what it is, is butter -- and the chantilly frosting that's on the top. It is a cheap way to cheat on your diet -- one Coco Puff." Ranato Bornios has been working for six years at the bakery, spending eight hours a day filling and topping Coco Puffs. 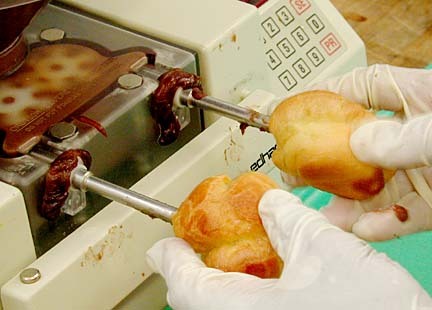 Two-by-two he inserts into the shells the nozzles of a machine that pumps in a prescribed amount of warm filling. (Secret to eating a Coco Puff: Find the little hole left by the nozzle and put that end in your mouth. When you bite down, the filling squirts into your mouth, not down your front.) 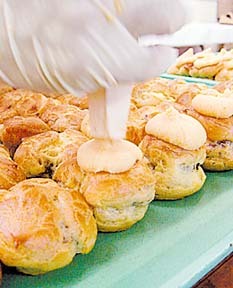 The chantilly topping is squeezed out by hand through pastry bags. How does the cocoa get into the puff? Over the years, he's gotten a little tired of Coco Puffs, Bornios says, but he still likes them, and he often brings a box home to his four children. Takakuwa doesn't think Liliha Bakery will be taking the Coco Puff to any new stores. "Once you start having branches, you either have off-site baking or a central kitchen and both have their disadvantages." The aim at the bakery is to keep nothing on the shelf more than four to six hours and that requires the chief baker to constantly watch what's moving and what needs to be replaced. "Once you branch out, that becomes difficult." Expanding the product line, however, is a constant, Takakuwa says. A successful bakery must offer customers a changing variety of items. to go into the freezer. One idea that never took off: Sourdough bread. Takakuwa says his father brought the recipe home from a baker's convention in the 1950s. "A customer comes up and says, 'Papa, your bread is sour. Something funny. It's old.' He stopped making it." Perhaps the idea was before its time. In its 50th year, Liliha is experimenting again with sourdough. Two years ago, Takakuwa introduced a variation on the Coco Puff, an ice cream-filled puff. "We got the idea from a product we saw at Costco. I thought, 'We can do that.' "
Sales have been disappointing, though. "I would've thought it would be as big a seller as the Coco Puff." Maybe buyers just aren't prepared to carry home something that will melt. Or maybe a phenomenon like the addictive little Coco Puff only comes along once in a bakery's lifetime. "I had a friend who said, 'That was the first time I had your Coco Puff.' Then she said, 'Let me amend that statement. That's the first time I had 10 of your Coco Puffs.' "
Marketing philosophy: The bakery's only advertising is in Japanese-language newspapers and radio. Hours: 6 a.m. Tuesday to 8 p.m. Sunday, 24 hours a day. Closed Monday. 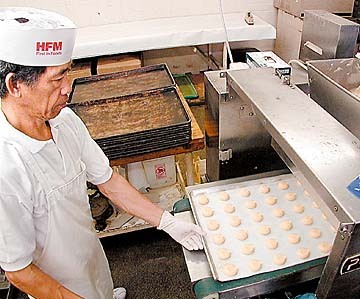 On the Wednesdays of August we will pay tribute to Hawaii's most successful bakeries -- focusing on the signature item that is each bakery's claim to fame. Our series, "Hawaii's Big-Time Bakeries," focuses on large-scale outlets, but we know there are lots of smaller, neighborhood bakeries throughout the islands known for particular pastries and treats. Tell us about your favorite and we'll compile the results in a guide to bakeries that will close out our August series. Send your pick to: features@starbulletin.com or to "My Favorite Bakery," Honolulu Star-Bulletin Features Section, P.O. Box 3080, Honolulu 96802. Fax: 523-8509. Deadline is Aug. 18. Comments may be published without compensation to the writer.